First thing first, we layout the pool with paint and string lines on the ground, we use our Laser Level to establish the desired height of the pool and how deep to excavate. It’s important to have your landscaping plans in place at this time. Great question, using a “dig sheet” which is customized per pool model and supplied by the manufactures, it outlines the depth of the pool every foot including full width’s. So the modern freeform pools are a breeze to excavate. Removing dirt is getting more difficult as the years pass, since many subdivisions and roads are near completed, the Dirt get’s disposed at dump sites, depending of type of dirt, weather and amount will determine how far we need to truck the dirt out. When the excavator operator accidentally over digs to deep, it’s a natural solution to just put the dirt back in the hold. STOP! That’s so wrong in so many ways… the best remedy is to continue excavating and then using HPB gravel base to raise to the proper level. This will ensure the pool won’t settle or shift over time. After the pool is set in the hole there needs to be enough room to get between the pool and the side wall of the excavation to place gravel under the seats, spa and steps of the pool. Typical over-dig should be between 10 and 16 inches on any side that requires manual backfilling or access to under the spa or bottom. It does happen when digging that you realize that the soil is unstable or is of organic matter, if the pool get’s installed without this condition being corrected, chances of settlement is very likely. Even though it would require more soil removal with disposal and of course extra HPB gravel fill, this is a sure way to cut corners. A huge NO NO is leaving excavated soil behind and using it for backfill, it’s easily done especially if the home owners are not around during the installation. This is well known shortcut and it will be detrimental to the settlement and shifting of the pool. You would never know until it’s too late. The finished height (also called elevation) of your fiberglass pool is very important in many ways, maintaining proper drainage of surface rain water, having a smooth transition from your coping stone to your patio walkway. Co-ordinating with the landscapers prior to digging and establishing a proper height, using a laser transit level is a must. Calling the utilities for clearance before excavation is a must. Older parts of the city is normal practise to have power or cable lines running through a rear yard. Remember it wasn’t always a subdivision, it might of been a farm with multiple homes sharing the same utilities. At this point the excavation is complete, the hole should be at the proper elevation and all loose soil fill is removed by hand. Setting the HPB gravel foundation is where the pool will sit once it’s in place. Using a laser level we ensure all points are at the right elevation. This task takes place either at the end of day one or the start of day two. Back in the day pool builders used Sand back fill and that created problems with fiberglass pools shifting, settling and bulging. 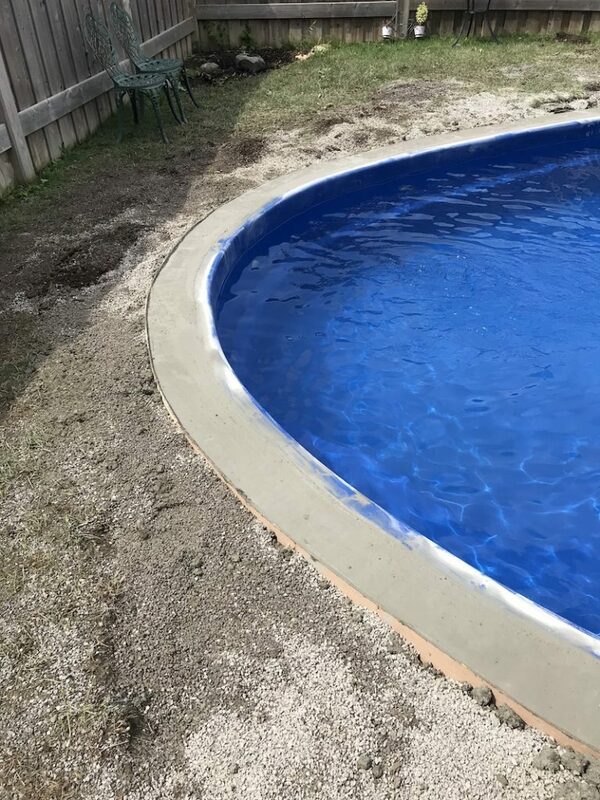 Let’s imagine your pool backfilled with Sand, over time that sand will slowly wash away, settle down to the bottom and leave the pool unprotected and very unstable. We do NOT use sand period. When Does the Pool Arrive? At this time the pool has arrived on a flatbed trailer transport with escorts, also depending on the size Police escorts may be required. Also the pool transportation company requires a MTO permit to transport your pool. When & How Do We Lift the Pool? We lift or pools with a crane 99% of the time over the house and into it’s forever home. Depending on the distance from the middle of the pool to the middle of the driveway or street, this number dictates which size crane and reach we would require. Walking in a fiberglass pool is a NO NO, I have to admit that we have done it once in the past due to space confinement. 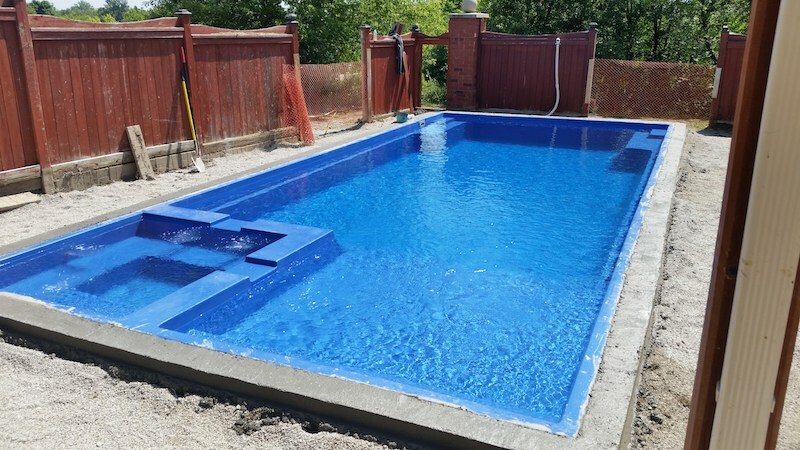 But it’s not recommended, the fiberglass pools come with crane handles built into the fiberglass and it’s the safest way to lift and place the pool. This ensures minimal to no damage to the pool, no splitting, twisting or bulging. We also install stabilizer bar supports for extra security and to maintain a straight pool. Why is Properly Setting and levelling the Pool so important? 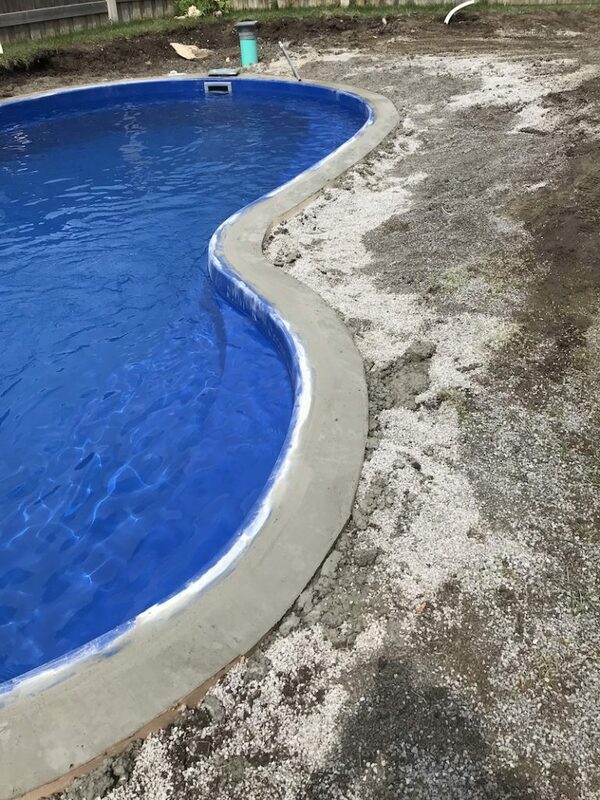 The fiberglass pool get’s placed resting on a solid gravel foundation, with it’s entire bottom floor resting on the HPB gravel base, ensures the pool is level and prevents the it from shifting and settling over time. As we try to achieve perfection, Fiberglass Pools are almost never perfectly level, and that’s OK! The industry standard is getting a pool level within 1″ but we achieve for 1/2″ within level. Many factors will affect this such as, transportation from the manufacture, if the pools were stacked and where it was on the stack, how long has it been sitting in the yard and being moved around. Even though the levelness of the pool has nothing to do with it’s structure it’s almost something that we try to achieve. We will repeatedly lift and re-set the pool shell as many times as needed. Using the crane to lift slightly and adjust, using wood posts and backfilling under the pool steps as well. With some pool models the stairs are always the most difficult to backfill and we use our own system with rigid Styrofoam blocks to support the steps area. These blocks are custom made to fit your pool model, styrofoam is weather resistant, rodent & insect resistant and will not shift or settle. A common mistake is rushing through this critical stage which only leads to pools being out of level or eventually shifting or settling due to the pool shell not resting on a proper foundation. After this we would require the use of your water hose to fill in about 12″ of water before we can finalize the setting. Plumbing the pool is composed of two major components: the pool equipment which includes the cartridge filter & pump; and the interior jets, skimmer & water features in the pool. The pool equipment pad (precast 3′ x 7′ cement pad supplied) is placed aprx. 25′ to 50′ away from the pool. Longer distance may occur and it really depends on the layout of the yard and personal preferences. If a gas heater is also being installed it’s important to note that in Ontario a minimum of 10′ distance from any opening to the home must be maintained as per TSSA regulation. All Plumbing pressure tested to insure they are leak free. Once the plumbing is all set, pool shell is level and plumb it’s time to start the side walls backfilling. It’s important that while backfilling the outside that the water on the inside are brought up together at the same level. This prevents any bulging of the walls and equalize the pressure. What Type of Gravel do we use to Backfill the pool? The type of gravel we use is HPB and 1/4″ super clean limestone gravel from local quarries. Clean means it’s free of fine dust, stone particles and it’s washed. This gravel stone compacts when placed, meaning there is no need to tamper the gravel, has excellent drainage while maintaining it’s structural component and it’s point on point friction between the pieces of stone actually lock together allowing it to hold well on the side walls of the pool. Our ground water management system is now installed at the bottom of the excavation in the deep end of the pool, it’s a sewer grade 8″ PVC pipe that sits at the very bottom and comes complete with a patio lid cover so not to worry the pipe is not visible once the landscape patio is complete. There is no permanent pumping system installed but it is supplied, this pipe simply allows us to access any ground water around the pool in the event the pool requires draining or if the lot has a high water table. Not Having One at All! We have witnessed pools popping out of the ground all the while they didn’t have a ground water management system or worse the home owners were never educated on how to monitor their ground water. Concrete gunite and liner pools also should have a ground water sump system, they are also prone to popping & bulging out of the ground. Every new pool owner and any new home owners with existing pools all get a detailed Pool School session from testing water levels, adding chemicals, operating their pool equipment and lastly ground water management using the sump pump. We also offer Pool School as a service for anyone wanting to learn and get to know their new pool regardless who installed it. not our picture, not sure where it came from but I like it. By this stage the pool is all set, plumbed and ready for some serious splashing, but let’s not forget the landscaping. Before any patio or coping stones can be placed, a concrete collar ring surrounding the perimeter of the pool must be completed. This step can be performed by us or your landscape team. We pour a concrete gravel mix into the forms surrounding the pool, with rebar cross tied to create one even pour and solid structure once cured. 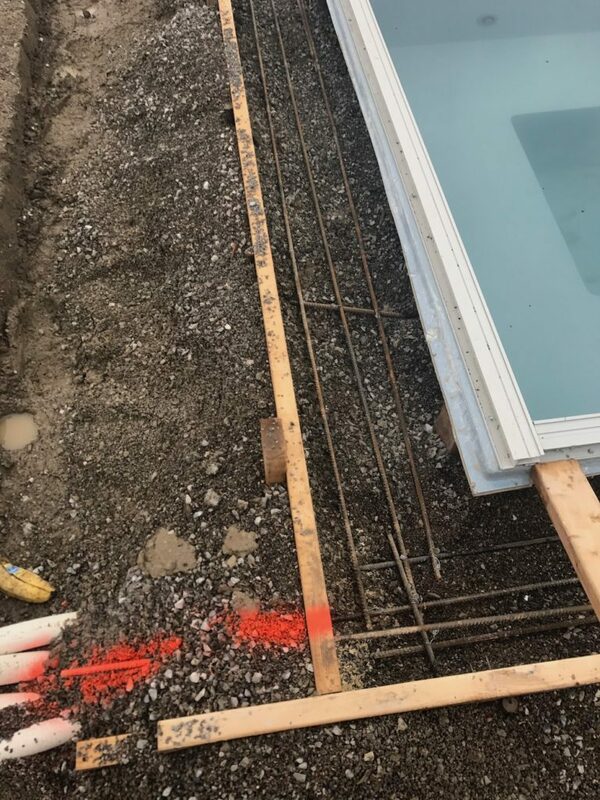 The depth of the pour is deeper near the side walls and tapers out 10″ to 12″ deep, with a width of 8″ depending on the coping stone or patio stones being used. Congrats your pool is fully installed and just waiting for the finishing touches by the landscapers!